This was a little farmhouse in the village of Vagliagli in Italy's Chianti Region which I've walked by many times during my stays in Tuscany. On this particular day, I noticed the different shapes and angles of the buildings and the way the sun light illuminated the urn and flowers in the front garden. Here's the lastest in my "Enchanting Italy" series. Light struck roses in front of a farmhouse in Tuscany. I had to restrain the pull to define the stonework on the building, so it would just be a suggestion of texture, receding to the back and not compete with the flowers. Here's another painting of one of my favorite views of Lake Como in Italy from the shore of a small town of Varenna. This is part of my current painting series "Enchanting Italy" that I'm working on for an upcoming show at the Frameworks Gallery in Marietta GA. The show opens 3/29. 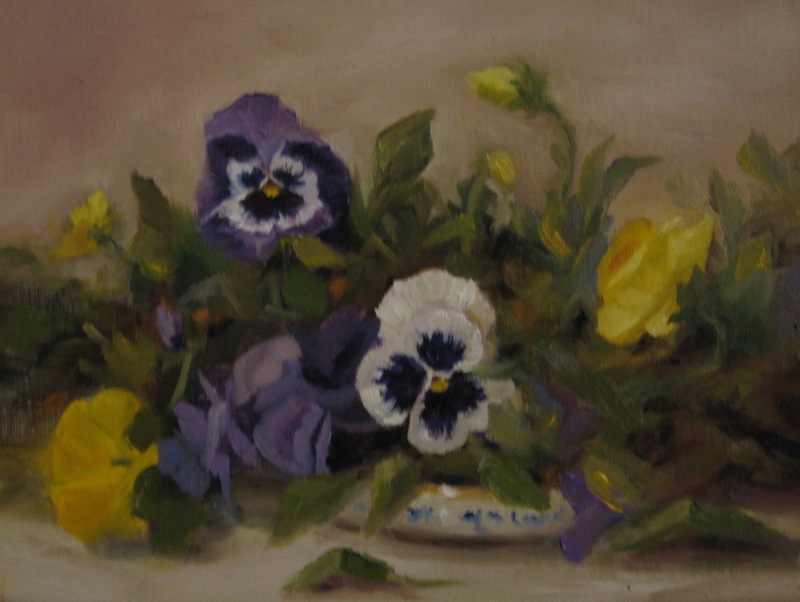 Kathy Anderson workshop -Pansies Galore! Last week I spent a few days at the Scottsdale Artists School taking a workshop with Kathy Anderson. Like me, Kathy loves painting flowers and we spent 3 days surrounded by pansies from the local nursery. Above and below are a couple of my paintings from the workshop. Here I am on right with Kathy Anderson on left at the workshop. Kathy's demo painting is in the background and below is a closer peek at her amazing work. Here is some of our inspiration- pansies galore- and a few geraniums too! 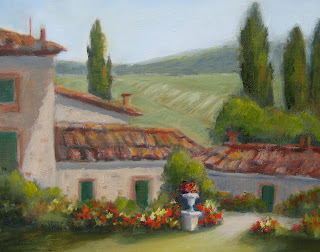 Working on a series called " Enchanting Italy" for an upcoming show. This painting is based on several photo's from a workshop I taught in Italy. Tried the panoramic format for a change. Tried something a little different here. Had a large bouquet of flowers of hydrangeas and roses and did a close up of a portion of it for a little more abstract viewpoint. I did this painting awhile back but had been holding off posting it since it was a surprise Christmas gift for a friend. My friend Terry, who lives in Charlotte, has a lovely fountain with plants near his front door. One day while I was visiting I noticed the sunlight on the fountain. I thought it might make a fun, special and unexpected painting for him so I snuck a few photo's when he wasn't looking then painted it when I got back to my studio. One of the best things about being an artist is the ability to make something meaningful for someone who appreciates that it was created especially for them. That's one reason I actually like to do commissions. Often they are a very thoughtful and unexpected gift for someone who is very special to the person who has commissioned the art. It's an expression of their love. This week I'm starting on a romantic one. A client commissioned a beautiful scene from the couple's 10th anniversary trip that will be a Valentine's gift for his wife. I'm glad to be part of enabling him to provide something extra- special and memorable for his wife. Better get to work! I spent most of 2011, focused on painting florals and still life. I painted over 150 paintings, including completing my "floral challenge" of 50 floral studies ( all are posted on my blog in the 2011 archives approximately August-October), got a certification in floral design after completing a program at the Halls School of Floral Design in Atlanta, and studied with some artists who I consider to be masters, especially with the subject of flowers including Robert Johnson, Nancy Franke and Hedi Moran. I have always loved flowers and that was one of the subjects I first was drawn to when I started painting nearly 18 years ago but in recent years I'd been doing many more landscapes. I learned even my family name "Fiorello" means "one who lives near a wall of flowers" so it's probably no accident I'm drawn to surround myself and others with flowers. 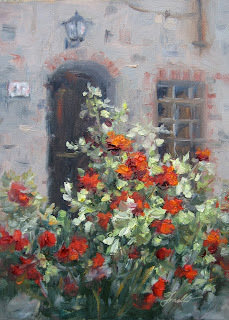 I have taught flower painting classes in watercolor for many years, but in 2012, I will be offering my first oil painting workshop "Painting Flowers Alla Prima in Oil" at the Art School in Sandy Springs. It will be on Sat. & Sun. March 17 & 18. I'd love to have you join me for a weekend of fun, painting and beauty! A few weeks back I had a beautiful bouquet of multi colored roses. Rather than arrange them in a vase as I often do, I tossed them on a table in my studio along with some petals, leaves and berries to just do a study of a casual arrangement for a change. Today is my first day back in the studio in 2012. I actually haven't started painting yet, plan to do that tonight. Spent a few hours going thru about 10 photo albums from past trips to Italy looking for references for a new series for 2012 " Enchanting Italy". It's hard to choose, but came up with about 30 of my favorites for inspiration as a starting point. Mostly images of Tuscany and Lake Como. They are currently all laid out on the floor so I can see how they look and feel together. Later I'll put them in a smaller album so they are all in one place, ready to find as I work thru this series over the next few months. I like working in a series this way- I have a group of related subject matter to work from to stay focused but on any given day I still can choose from among the "finalists" to do what I feel in the mood to work on that particular day. In the meantime, I posted one of my hydrangea studies from before the holiday" break". 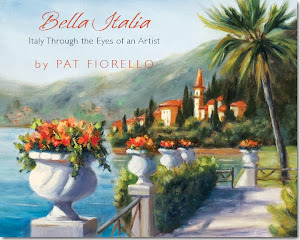 New paintings of Italy coming soon. Now back to the studio. As we welcome in the new year, I thought I'd share this painting-it's the last one I completed in 2011. I call it Volpaia Welcome. It's based on a doorway in a picturesque, little known village in the Chianti Region of Tuscany. Each year when I teach in Tuscany I try to get in a little photo op in this town because it is just beautiful, romantic, quintessential Italy. I've been away for the past couple of weeks with holiday and family travel so haven't done any painting and looking forward to getting back to the studio this week. 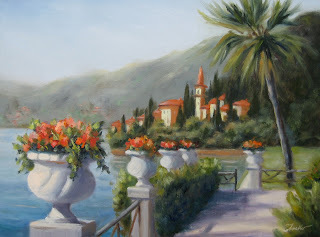 I'm going to be working on a series " Enchanting Italy" for a gallery show I have coming up in March, so expect to see more Italy paintings over the next couple of months, with a few floral still life paintings occasionally as well. Best wishes for a happy, healthy and successful new year, however you define it for yourself.